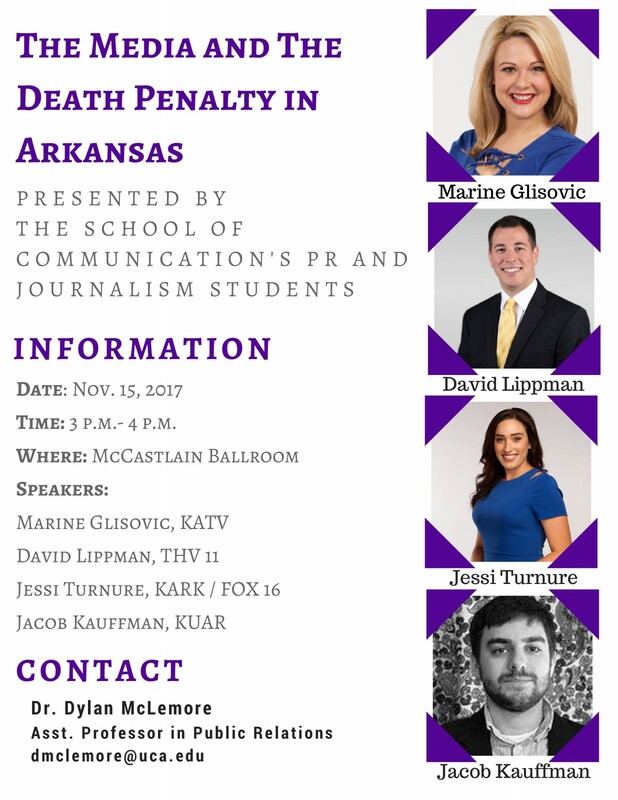 Arkansas journalists who covered this year’s executions in Arkansas will visit the University of Central Arkansas Wednesday, Nov. 15 from 3-4 p.m. to discuss their experiences. The session will be held in the McCastlain Ballroom on the campus. The UCA School of Communication’s PR, the Press and Public Affairs class is hosting the event. 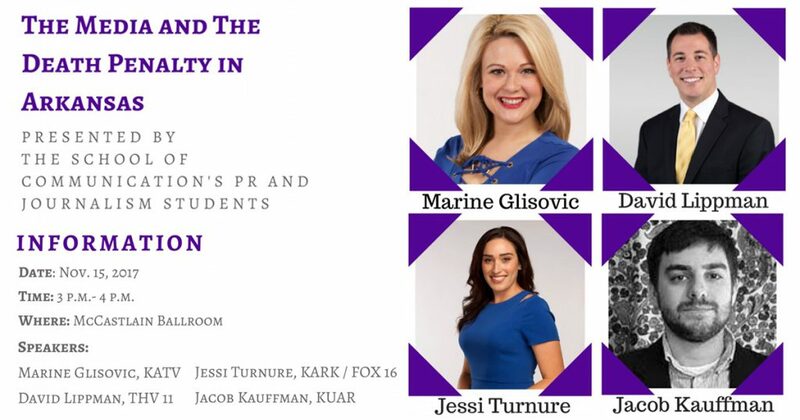 A panel of journalists including KATV’s Marine Glisovic; THV 11’s David Lippman; KARK/FOX 16 Capitol View Arkansas host Jessi Turnure; and KUAR’s Jacob Kauffman will recount their experiences covering the death penalty in Arkansas. “These reporters will bring their unique perspective to the discussion and will share their own stories from covering an unprecedented series of executions at a time when the world’s eyes were on Arkansas,” said Dr. Dylan McLemore, assistant professor of public relations, who teaches the course. The forum is open to the public and will provide insight on the procedure, challenges, and experiences that accompany covering executions, particularly the position that the State of Arkansas was recently in during April 2017, where the state was waiting for the Supreme Court’s rulings nightly in order to proceed with the scheduled executions. “Discussions need to be held on topics like this, no matter how controversial. When we hear others’ opinions and perspectives on why they believe what they believe, it helps us to not take our beliefs for truth” said Chandler Watkins, a student moderator for the forum. The University of Central Arkansas School of Communication is a collaborative community of dedicated faculty, staff, and students engaged in the study and practice of communication. As communicators, journalists, public relations practitioners, rhetoricians, and writers, we teach and research to facilitate student learning and growth through caring relationships, innovative curricula, and experiential learning. Find The UCA School of Communication online: https://uca.edu/communication/, and on social media, https://twitter.com/ucacomm/, https://www.instagram.com/ucacomm/, https://www.facebook.com/UCAComm/.